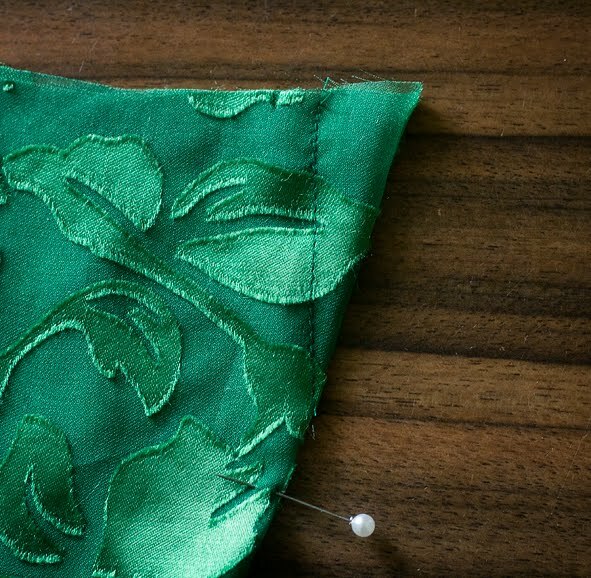 After making my emerald shift dress I found I was left with about 70cm of fabric, so I thought while the sewing machine is still threaded up with green thread, I would put this remainder to good use by making a camisole top – the #101 top from Burda 12/2006 to be exact! 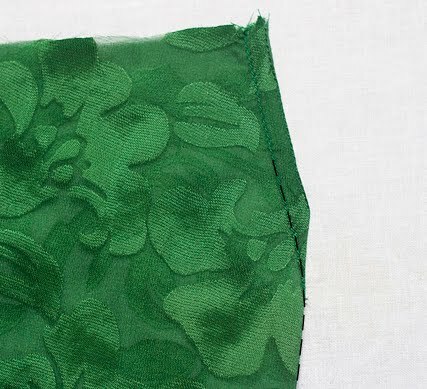 This style features an empire line seam with bust darts, and I thought I would share with you a technique that comes in handy sometimes when you are sewing darts in sheer fabrics. In the above photo the dart on the right is a normal dart, but through the sheer fabric you can see the dart fold which is rather ugly. 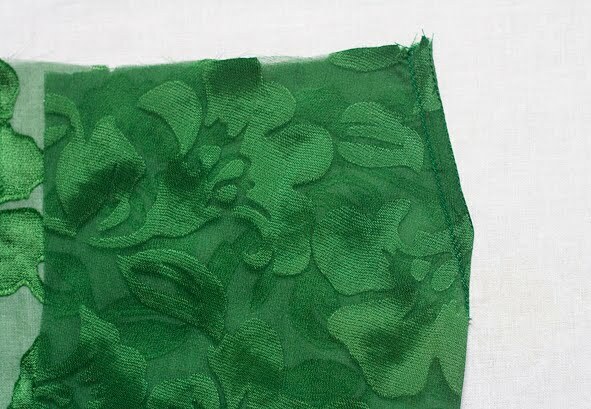 In some fabrics such you are able to trim this away, but this chiffon frays too much for that. Often you are able to enclose the dart fold within your interlining, but what if you don’t want to use interlining or you need to keep the dart free of it? The answer lies in the dart on the left which is french seamed. It still has the neat appearance of a trimmed dart, but is far stronger and will not fray – so you can breathe easy! 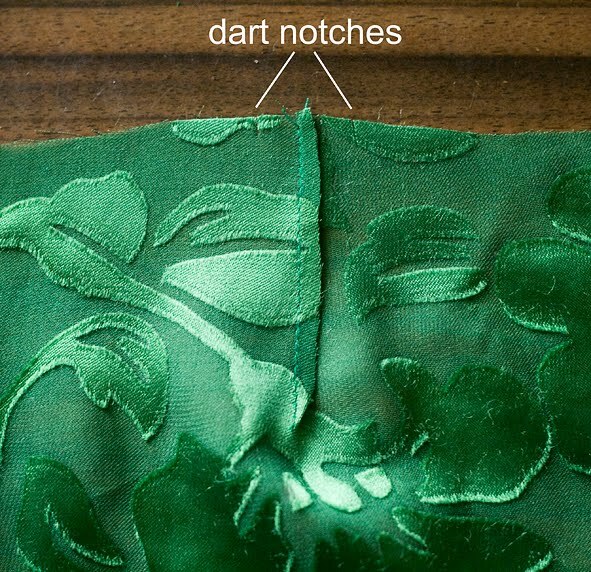 Fold your fabric as you normally would for a dart, but with wrong sides together. Here I have lined up the dart notches, and marked the dart point with a pin so you can see it clearly. Imagine your usual stitching line, and stitch within your dart allowance 7mm (a good 1/4″) away from this line. You will find that you end your stitching some distance before the dart point, and you needn’t worry about tapering the point at this stage. Press the allowance to one side. 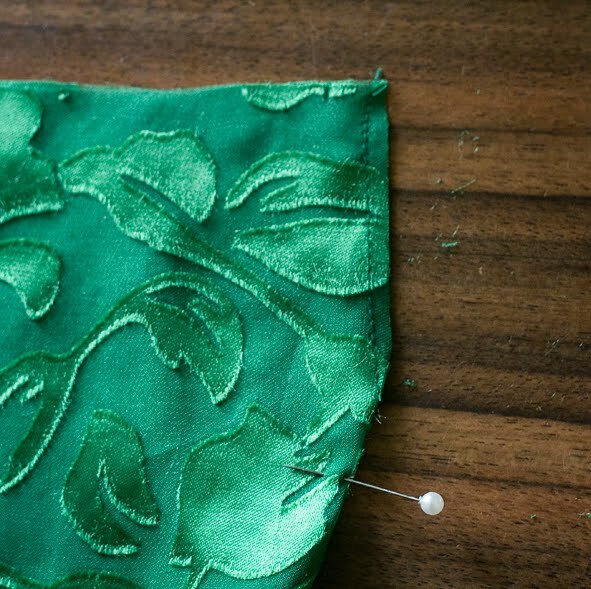 Refold your fabric along your stitching so it lays right sides together, and encloses the trimmed dart allowance. Then stitch your dart along the normal stitching line – at first this will be 6mm (1/4″) from your first line of stitching, and then it will taper to zero at the dart point. 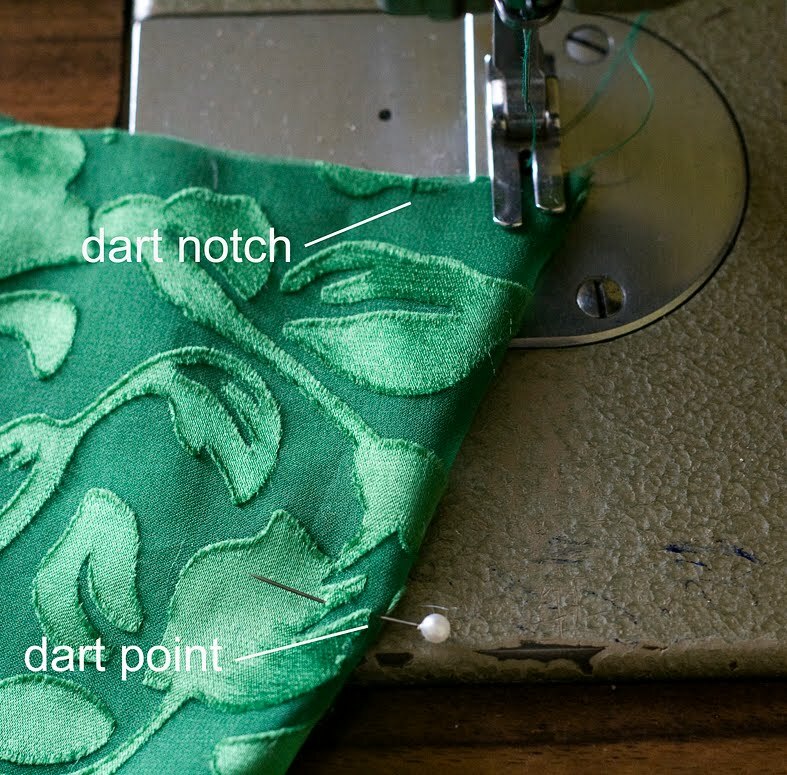 Once you have stitched your dart, lay it flat like this and check to make sure your stitching line tapers to the folded line in a smooth curve, with no wiggly or pointy bits! Press your dart as usual, and now sit back and admire your lovely work! Sometimes the simplest little tricks are the best! What a great tip for sheer fabric. Thanks for sharing and love the clear step-by-step phots & directions! What a great trick! Thanks for sharing! Wow! Just came across your blog! Thanks for these instructions…I LOVE the dress too! This is incredible! Been sewing for nearly twenty years and never seen this done before. I'm fretting a bit about darts in a wedding gown I'll be making for my daughter soon. In taffeta, she wants Sabrina's ball gown column dress/train and a elbow-length sleeved bolero with ruffles around the “lapel”/neck. 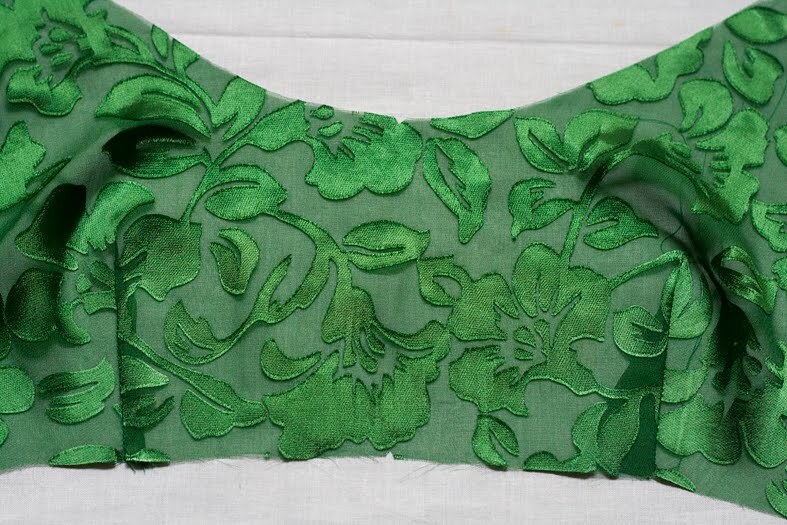 I'm making a sleeveless (not strapless) bodice, and because the bolero's basically a minimalist shrug (not much bodice/front; as short as her bust line), I'm thinking I'll do darts as opposed to princess seams. I know the bodice will have waist darts that align with the column skirt, but I think I want the bust darts hidden under the bolero for sure. You said this tute was for sheer fabrics, so I won't be using it for taffeta darts, but I still learned a valuable lesson today. Thanks! That's genius! I've been trying to do something like this, but I started by putting the right sides together – no wonder I could never get this to work! The penny's finally dropped: now I understand! Thank you so much for the photos, they were a huge help. This is amazing, i have always wondered what to do with sheer fabrics, since i don't wear any of sheer fabrics, did not delve into it, if i make a dress using sheer fabric, i will use this tip of yours…Thanks a ton. Thank you, very interesting. I've never seen this before. Wow, your blog is a gold mine! I am sewing a dress from silk chiffon with side bust darts, and was really annoyed thinking about how the darts would be showing through the sheer fabric (this dress is a cowl-neck style, so I thought that it would drape better if I didn't underline it and only lined it). 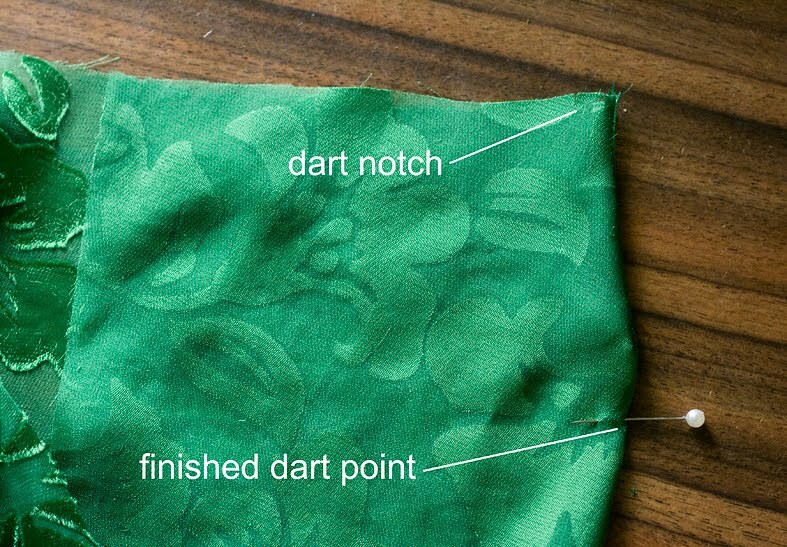 I am definitely going to try this method to sew my darts now, no both the shell fabric and the lining. Thank you so much for posting this! Thanks for sharing a nice tip. Love to hear more. 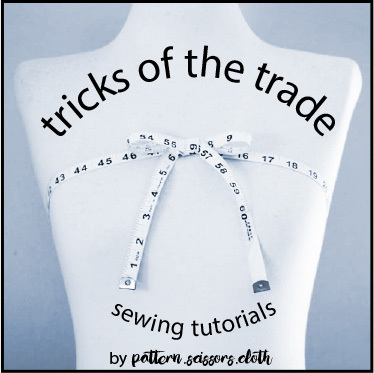 Hi, i've been sewing for a long time and this is one tip i realy appreciate. I know it's simple but nobody posted it but you. Thanks a lot. Hope to see more. I have just attempted this technique but am having difficulty finishing it off. Thank you for this. I have been looking for how to make darts with a sheer white chiffon for two days now so that the darts didn't show. I thought about doing this, but since I don't know what I am doing – self taught – I didn't know if it would work or look nice. This is easy to understand, I will give it a try, thank you. Thanks for sharing this tip! I used it today to create darts in some INCREDIBLY sheer fabric and it worked a treat. Awesome – this is one of my all-time fave methods as I love how minimalist the darts look!